Hi folks! Here's another review of a Rick n Morty episode, this one is filled with a dizzying amount of obvious privacy, anonymity and totalitarianism references. If you like the internet, Tor and your freedom of speech I think this episode has a lot of allegory you would appreciate! There is a lot to explain in this episode so I'm breaking this up into a series of posts. Anyway, Enjoy! Council of Ricks accusing Rick of a crime. The allegory here is that a Rick that is differentiated on meaningless superficial features has authority over someone that is exactly the same as him. This expression is (I think) meant to "point" you to how your own governments can sometimes behave; bureaucratically blaming people and punishing them for being no different to them. Close encounters of the Rick kind is an episode that features Rick being accused of a crime; running away from the cops and eventually being captured by the villain himself allowing him to solve the crime and release him from his charges. The opening scene features a shocking random murder of Rick; we later find out this is actually not "our" Rick i.e. C137. 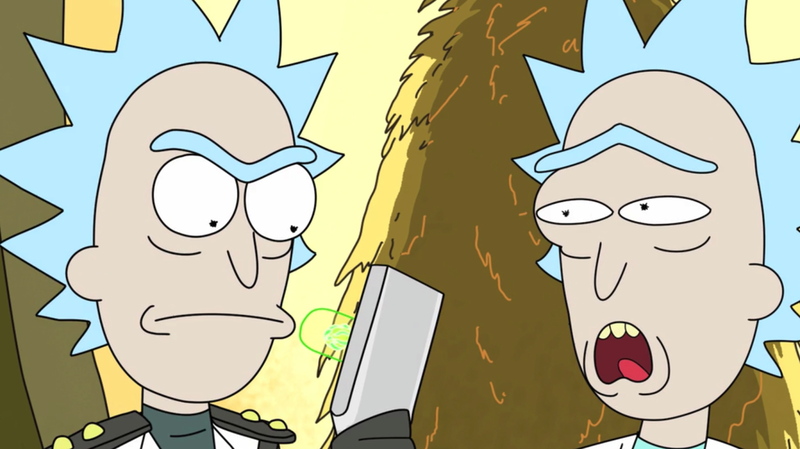 What has happened here is our mechanism for identifying Rick was violated; the writers purposefully employed what we use to identify Rick in order to lead us to mistake him for someone else. The writers have effectively stolen Rick's identity and exploited our trust in it (a subtle reference again to the allegory of the rest of the episode). We know that they stole our Ricks identity because they purposefully indicate (via villainous facial scaring on the murderer) that the Rick doing the murdering is not ours. So the identity theft the writers pulled off is obvious! at least in my opinion :) This is important to remember for later! Luckily for us C137 was not murdered we find out that some other Rick was in fact attacked. But the council, having arrested our Rick; seems to think he is responsible; of course the audience sharing Rick's perspective knows this not to be true; setting up some important dramatic irony. Rick is marched through the Citadel of Ricks (which very importantly rhymes with "Council of Dicks"-I will explain this later*). What you need to understand is that this space station is meant to be seen as a kind of Government. Rick is arrested, accused of a crime; and shackled;these are the actions of a governmental authority. Now what is special about this authority arresting Rick is that they are very obvious composed of people exactly like Rick himself; here the writers (in my view) draw a strong analogy to the government itself-they are people just like us! 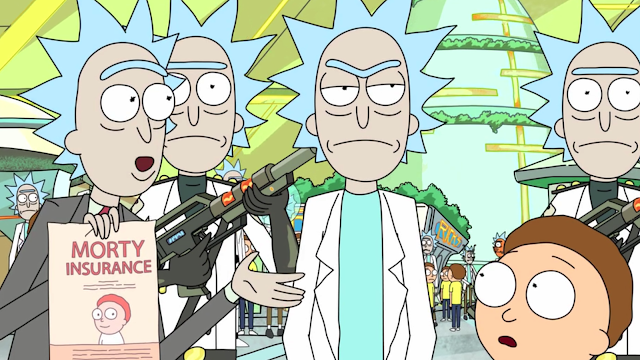 Rick being harassed with advertising for no other reason than looking like a Rick and being in the citadel. An obvious expression of advertising companies abusing our data in order to advertise to us. Another double meaning to the imagery of the Citadel is that it is actually also an analogy of the internet itself; a bunch of seemingly similar people (IP's and Web addresses) only really distinguishable by superficial and habitual features (Your IP, MAC address, Time-Zone and the web sites you visit). The Citadel as an expression of the internet. The military; odd exclusive clubs; lots of bill boards and a whole lot of people that look exactly the same except for a few small changes in behaviour and appearance. As we are escorted through the Citadel; Rick explains that the government was formed entirely because a bunch of people that hate him and wanted to band together against him. Rick seems to have a bad opinion of this authority saying that they actually "hate him for his genius". Which is another way of saying that they are trying to tell him what to think; say and do. The council of "Ricks" is trying to prevent Rick from being a Rick; which is ironic again because they are Ricks themselves. The irony I think is meant to draw our thoughts to governments that imposes such sanctions on its people; meaning to say that limiting someone's mind or genius (i.e. to take away their freedom of expression); is to hypocritically deny them something they (the government) enjoy themselves-freedom of thought and action. They are (being) Ricks; but at the same don't want Rick to be Rick. They also alone want bureaucratically the only power to decide how much of a Rick every Rick can be...except themselves lol. *And now you see why the are called the council of "R"icks! We are then presented with an obvious reference to privacy and the internet when Rick's Portal Gun (the way he travels to his own private destinations) is seized unfairly and searched for data that can help finger him for the murders. The government seizing Rick's internet traffic-oops I mean Portal Gun. "Aww, cmon; don't look at another man's portal gun; we all go to weird places!" Which is basically Rick saying it is unfair to scan his portal gun because his data doesn't paint a fair picture of him. An obvious reference to the disgusting practices of many of your governments today; ransacking people's private property and communications in order to unfairly blame us for their interpretations of our data. Rick knows to oppose this method of trail because it leaves his data to the whims of their interpretation; should they find him guilty of something as serious of murder it means that they would be doing nothing but downloading his data and then killing him! After having his private data ransacked by the council; Rick expresses his distain for this method of investigation by screaming that someone should only be arrested if there is sufficient evidence to blame them for the crime. After being accused of the murder and seeing that he will likely die a Socratic Death by the hand of the council. He then flees jump through a couple dimensions. What happens next is an absolutely brilliantly constructed piece of allegory. Rick jumps into a realm composed entirely of Asses just spewing gas. As I have alluded to earlier this is an encapsulated expression of us on the internet; nothing but a bunch of assholes blowing hot air. Here come's the brilliant part. Next he jumps into a dimension where everything is exactly the same as our universe except pizza's eat humans instead of vice versa. What has happened is a single property of our universe was swapped or permuted! Permutation is an operation used in cryptography; it makes sure the cipher or encryption operation achieves an important property called Diffusion. 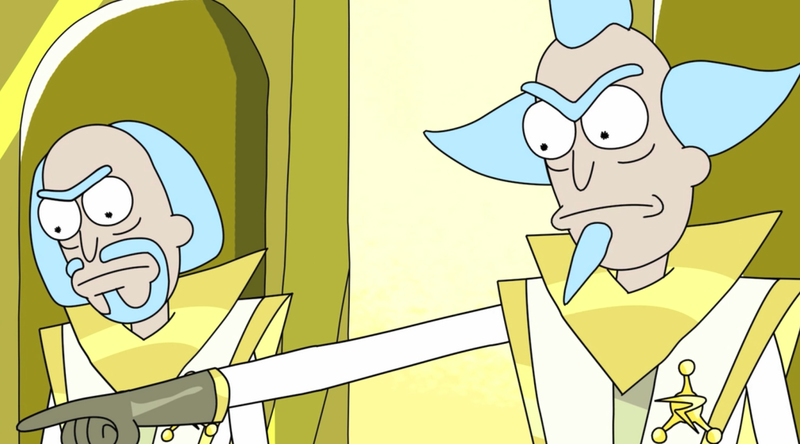 Next Rick jumps into a universe where there are greasy grannies for some reason; what happened here is we have become confused! And guess what confusion is also a property encryption ciphers need in order to successfully protect data. So we know that Rick is combining permutations and something that achieves confusion in order to get away from the cops; but he is missing something. The final step to making sure you can never be tracked! After jump through a couple galaxies Rick finally gets to one where nothing makes any sense: in a way he has achieved perfect encryption. Suddenly it is much harder to describe what is happening in the universe Rick chose; its totally obscure. That is what data looks like when it is properly encrypted; you cannot distinguish it from complete nonsense. Tor is free software for enabling anonymous communication. The name is derived from an acronym for the original software project name "The Onion Router". Tor directs Internet traffic through a free, worldwide, volunteer overlay network consisting of more than seven thousand relays to conceal a user's location and usage from anyone conducting network surveillance or traffic analysis. Rick manages to get away from them by opening a number of portals confusing the authorities as to which one he went through. This is literally what TOR does; it routes your traffic through a number routes erasing the routing data as it goes along so that when your traffic hits its destination; the destination cannot determine the origin of the message (see the diagram below). I think the writers put this in so that someone could draw an analogy with the Portal Gun and the internet. If you think about what the portal gun does it acts literally like internet access; giving you access to multiple dimensions (some of them filled literally with Giant assholes that do nothing but spew gas)-here's looking at meeeeeeeeeeee hehe. Diagram on the broad strokes of Tor's operation. Basically your traffic is sent through a mesh network that obfuscates the origin and destination route of your traffic. After escaping from the authorities via TOR, Rick takes to reverse engineering his Portal Gun to see how it was sabotaged. 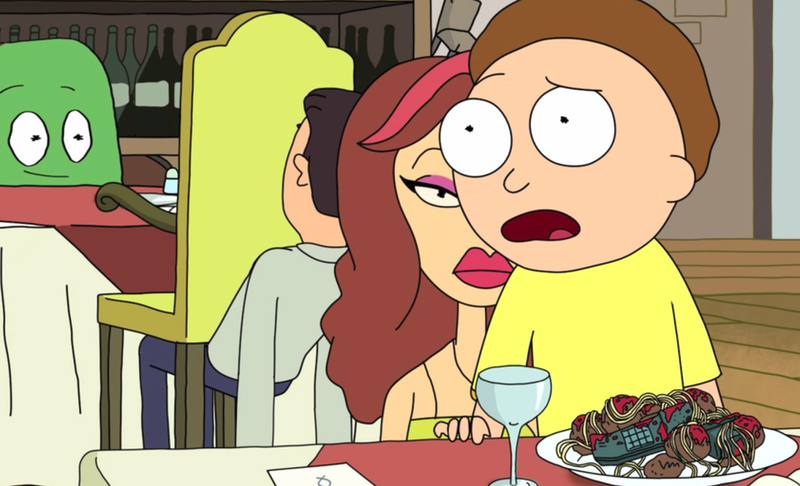 While doing that he and Morty are enjoying some Italian food; which in the universe they happen to find themselves in is spaghetti and meatball bolognese with pieces of phone in it. Another way to say that is telephone spaghetti with pieces of meat inter-mixed in it, which is literally what the internet is: A bunch of phones connected to one another in a spaghetti like mesh. And the pieces of meat? Thats us! In this scene Rick explains to Morty how the perpetrator manages to stay hidden from the Council; by obfuscating his Signal with Morty waves. What Rick is explaining here is the process of confusion (as in the portal jumping scene) in Cryptography; or you could also say this an expression of Steganography. Its a portable analogy because Rick is explaining how the evil Rick manages to make his signal indistinguishable (a concept core to many privacy/anonymity mechanisms) and therefore unsearchable by the Council of Ricks.